‘Of what?’ I asked when my feet landed on the swim step of a Palm Beach 65 Flybridge with Guilty emblazoned on the transom. I didn’t even know it had been accused. Could I trust it? Was this the ‘Christine’ of boats? Should I call my wife and tell her where I am in case something happens? Crazy talk. Obviously, the name has to do with the owner, since boats don’t have consciences. After all was said and done, I decided the yacht could be guilty of any of the following ‘” none of which is a bad thing: being the first of its kind on the West Coast; using teak to maximum effect; combining the strength and seaworthiness of a Down Under boat with the style of a European flybridge and the spac­iousness of an American yacht; and being an entertainment mecca. 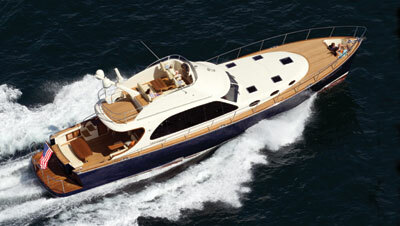 Guilty really is the first Palm Beach 65 on the West Coast, the third 65 hull overall and the first with a flybridge. The Australian company, founded by Mark Richards in 1995, is seeking to beef up its U.S. presence. Andy Shoemaker at Ballast Point Yachts in San Diego is the Palm Beach dealer, and he arranged for my sea trial with Guilty’s captain, Mitch Marvosh, who was waiting for me on a beautiful Santa Barbara April morning. He and first mate Shaun Plomteaux were on the aft deck to say hello. That deck is a gathering and entertaining area unto itself ‘” and the second introduction to the Burmese teak that dominates this boat. The swim step was first. The soles of the aft deck, the sidedecks, the foredeck, the flybridge, the helm area and belowdecks are all teak, as are the interior walls and cabinets, all of the tables, the window and door frames, and the caprails. The yacht could be called Kon Teaky. The aft deck has a bench settee with seating for at least four at a glossy teak table at the aft transom, and there is a cozy three-person L-shaped settee with its own teak table fore and to starboard. The flybridge overhang comes out far enough to cover the smaller settee and leave the aft loungers in sun-soaked comfort. To port in the forward corner is a cabinet unit with a sink, a refrigerator, and lots of storage and counter space. About the only accessory missing is a grill, but that is an option. The ladder to the bridge is also to port, but this isn’t a ladder with plastic rungs that can cause trouble for climbers. The steps on this ladder have wide teak footpads ‘” wide enough for my size-15 feet ‘” secured between stainless steel rails. Through a French door and up one step is the salon, which is flooded with natural light through four large, tinted windows on each side, a three-panel windshield and two large, tinted windows in the aft bulkhead. The window tinting mutes the sunshine just enough that it’s not glaring and keeps the main cabin a little cooler. The aft windows and the ones at the helm station retract to open up the salon space even more. And if retracting windows raise a red flag, as they do for many veteran boaters, Palm Beach has an answer. ‘They have a great system to capture ‘leaks,’which are unavoidable on retracting windows on a yacht, and channel them out versus assuming that the seals will always work perfect ‘” as they never do,’ Marvosh said. To port is an L-shaped settee with a table that folds in half to open up the space for entertaining or just passing through. The settee will easily seat six. To starboard are two loveseats facing each other with a coffee table between. With the aft starboard window down, people on the salon loveseat and the aft deck settee can easily hold a conversation. Forward of the loveseats is a retractable 46-inch flat-screen TV with 3-D capability. Forward of the salon are the helm stations, which extend the width of the cabin with a break for a walk-through to the belowdecks accom­modations. 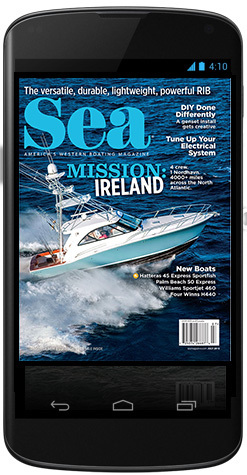 Four Stidd captain’s chairs and Garmin electronics occupy the port and starboard stations, and while both stations have joystick controls for the Volvo IPS 900 engines, only the starboard station has a steering wheel ‘” teak. No accidental tugs on the wheel by a too-helpful navigator. Down three steps between the helms is a galley to port and a living space to starboard with a settee, a wine refrigerator and a 40-inch flat-screen TV. This space can be a third stateroom, but configured as it is on Guilty it creates a cozy retreat for parents who need to get farther away from the kids and closer to the wine. The galley is fully equipped with an induction cooktop, an oven, a sink, a refrigerator and freezer, a microwave and ‘” at least on this boat ‘” a Scotsman ice-maker. The owner is particular about his ice cubes. Aft of the galley and down two steps is the interestingly configured guest stateroom. It’s one room whose halves are mirror images of each other: double beds, hanging lockers and built-in nightstands. In between is a 32-inch flat-screen. Headroom is abundant at the front of the room, but over the beds it’s limited. The master stateroom is in the bow and has an en suite head with a Tecma residential-style toilet, a glass shower stall, a vessel-style sink, and plenty of storage lockers and drawers. The stateroom holds a king-size island berth with a 32-inch TV on the opposite wall, and the room itself is symmetrical ‘” a hanging locker and dresser on both sides, with plenty of storage in overhead cabinets and under the bed. The room could fit an additional piece of furniture, but it feels more open without it. Climb up the aforementioned teak ladder to find yourself on the uncovered flybridge. Three captain’s chairs occupy the helm, with the steering wheel, engine controls and electronics in the middle. A Mediterranean windshield wraps around the front half of the bridge, and an L-shaped settee and a table are aft of the captain’s chairs. Aft of that is the radar arm and another deck that can accommodate chaise lounges or chairs. One more seating area I have to mention is in the bow, sunk into the forward deck. A settee is situated below deck level such that your torso is above the deck, and it’s close enough to the front of the boat that it affords incredible views while under way. You can have your Leonardo DiCaprio moment without having to stand over the rail and risk falling overboard. 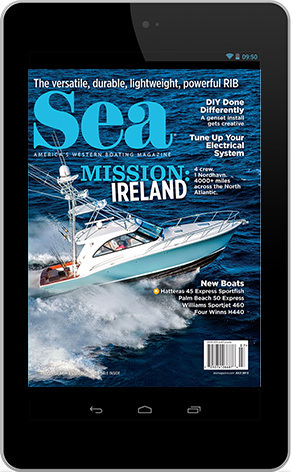 It was from the flybridge helm that we conducted our test-drive in 2- to 3-foot confused seas. 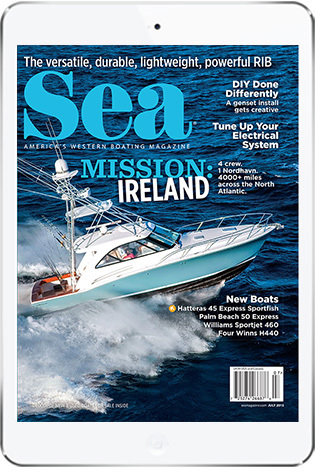 The 65 conquered the waves without too much effort thanks to the Quiet Chine hull’s sharp entry that widens out fairly quickly and keeps the boat dry. Marvosh said the yacht can handle big seas, which isn’t a surprise given the Australian waters it’s built for, smashing right through the waves. That’s something West Coast boaters can appreciate at various times of the year. The 65 handled well, responding to helm commands quickly and not exhibiting any shuddering or slipping in tight turns. I also noticed how smoothly the engines powered up from a standing start, something the Volvo Penta IPS common-rail diesels are gaining quite the reputation for. We managed to top out at 29 knots at 2300 rpm, which is less than the 32 knots the company was able to squeeze out of the boat, but the boat is fully equipped for cruising. At 2000 rpm, we hit 23 knots and were getting 0.5 nmpg. Marvosh said that in his time as captain of Guilty 22 knots seems to be the ideal cruising speed. At 1750 rpm, we were going about 19 knots and getting 0.6 nmpg, while 1500 rpm gave us 16 knots and 0.7 nmpg. Backing off to 1000 rpm got us 10 knots and 1.3 nmpg, which would yield a range of well over 1,000 miles. While the Palm Beach 65 looks like it might be more at home on the East Coast, it’s definitely a fit for Left Coast boating, capable of reaching Mexico or Alaska without too much effort. Outdoor space is abundant for the sunny days, and the interior is comfortable and well-equipped enough to ride out the rain or cold. It can also make for a good fishing platform for anglers. Whether an owner decides to go with the open flybridge likely hinges on where the boat will be used. Southern Californians are bound to like it ‘” or use it ‘” more than Washingtonians. If enjoying the amenities the Palm Beach 65 has to offer is a crime, then consider anyone who buys or rides on one guilty. This entry was posted in Boat Tests by Mike Werling. Bookmark the permalink.